“Palmyra was under control of the co-called Islamic State for almost a year. During that time, its architectural heritage was partially destroyed. 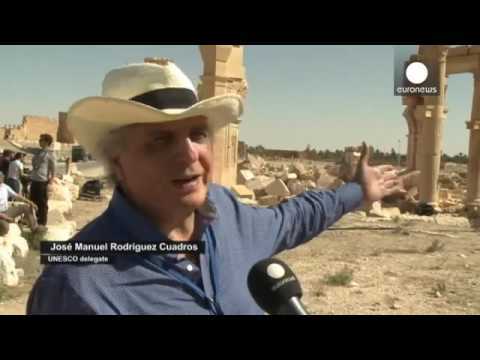 The iconic Bel Temple and the Temple of Baalshamin, built more than 2000 years ago were left in ruins,” reported Euronews’ correspondent Denis Loctier from the ancient site. International experts are on site in Palmyra assessing the extent of the damage. Many have expressed relief that the worst may have been avoided. According to Syria’s antiquities chief, Maamoun Abdulkarim 80 percent of the ruins are in “good shape” and restoration is possible though it will take years. Others, however, are less optimistic, and say there will probably be other priorities in Syria before rebuilding ruins, adding that what hasn’t been destroyed has in many cases been looted and sold by ISIL on the antiquities black market to fund its activities. Even if the restoration is made possible, it will always be just that: a replica, according to José Manuel Rodriguez Cuadros, from UNESCO. “When it comes to cultural heritage, damage is irreparable. We can restore an arch, but it will always be a restored arch, even if it’s made 100% from authentic components. Luckily, the destruction here isn’t total. So we have the base materials to undertake restoration work, and it’s not only the responsibility of UNESCO but of the entire international community,” he said. Before the experts were able to access the historic site, it had to be cleared of mines. The Russian military said in April it had completed de-mining the ancient part of Palmyra while there are still parts of the modern city where mines need removed. They say they have removed some three thousand explosive devices left behind by ISIL fighters. Before Isis seized the site last year and peppered it with explosives Palmyra was known best to archaeologists and historians. If peace returns to Syria tourists could flock to visit the city. It was in ruins before ISIL occupied it and still is. Many experts contend that is the nature of ancient cities and how this one should remain.